Our central sun has put on quite a display in recent months, painting the sky with bright multicolored aurora farther and farther down from the poles for everyone to catch a glimpse of its power and majesty. Throughout history the sun has undeniably played a central role in every culture and the evolution of our modern civilization. It has inspired monumental structures, calendars, and religious rites and initiations dedicated to the sun and its passage across the skies, now buried in the jungles of Yucatan, Mexico, Central and South America, as well as Europe, Egypt, the Middle East, all the way across to India and China. There are legends of Sun Gods who embody the promise of abundance and prosperity, not only in terms of agriculture but also as a source of knowledge and enlightenment. There are also prophecies of a new heaven and a new earth coming with the birth of a new sun. These prophecies and legends have been passed down from the East to the West through song and art and survive still carved in stone and in the hearts of the multicolored peoples that make up humanity. Our modern age now looks to the sun, not so much for religious or artistic inspiration, but to power our modern technology and as a solution to one of the most pressing issues in our times, the global energy crisis and health of our planet. There has been a lot of news reports, documentaries, and discussion recently about the dangers of solar activity and its solar maximum expected in December 2012, a date tied to ancient prophecy in many cultures and visions of cataclysmic proportions. SuperConsciousness had the opportunity to speak to one of the expert solar physicists from NASA who is currently involved in the latest cutting-edge missions exploring and closely studying the sun and its particularly intense and unpredictable active cycle. 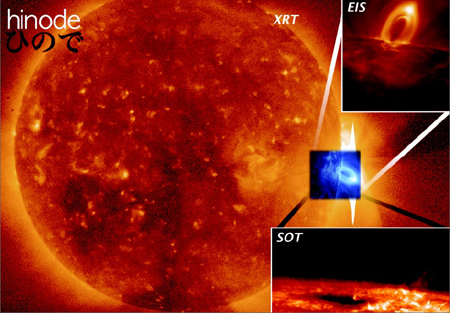 In this exclusive interview, solar astrophysicist C. Alex Young, PhD, creator of TheSunToday.org, and a member of NASA’s STEREO, SOHO, and HINODE missions, guides us through understanding the science and dangers of solar flares, CMEs, solar radiation, and geomagnetic storms. What do they all mean, and do they imply a greater impact on our planet than just merely stunning swirls of color lighting up the skies? 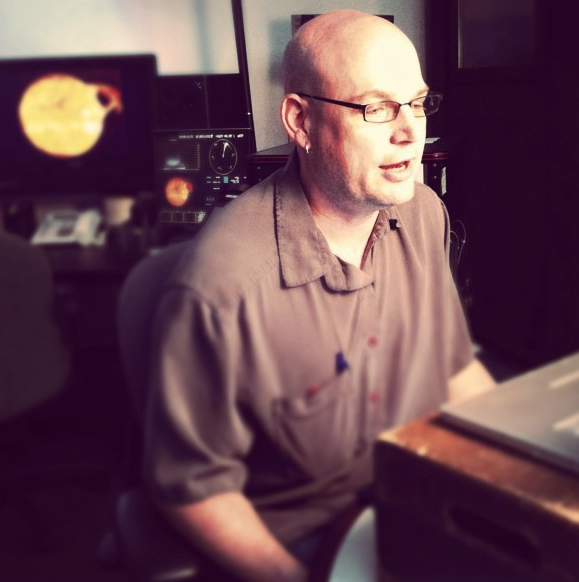 As an expert scientist on the topic, C. Alex Young, helps us shed a ray of light and knowledge on many current dark fears about the sun’s potential impact on our planet, way of life, and future. SC: Can you tell us a little bit about yourself and what you’re doing now? What led you to become a solar astrophysicist? C. Alex Young: I have been interested in science and, particularly, physics and astrophysics since I was a fairly young child, probably since I was seven or eight, maybe even younger. I got an undergraduate degree in physics and worked in high energy physics. Then I went to graduate school and studied something called quantum chaos, which is a theory joining quantum mechanics and chaos theory. In the process, I ended up working over the summer with some astrophysicists, worked for NASA’s Compton Gamma Ray Observatory, which was one of NASA’s great observatories like the Hubble, but was designed to study very, very high energy phenomena. And in the process, I studied gamma ray bursts for a while and then my advisor convinced me to switch over to solar physics, so I started studying very high energy emission from solar flares. After graduate school, my first job was here at NASA, Goddard Spaceflight Center, and I started working for SOHO (Solar and Heliospheric Observatory). And then eventually I started working for the STEREO (Solar Terrestrial Relations Observatory) spacecraft and the Hinode [the word means “sunrise” in Japanese] mission, which is a Japanese/U.S. mission. Currently I’m a member of the STEREO science team here at Goddard. SC: I guess there’s not very many sources of gamma ray bursts other than the sun around here, is that why the sun would be the logical place to study that field? AY: Yeah, that’s the best source, certainly, from our solar system. Most of the other types of gamma ray emissions we get from the universe come from much more distant objects. 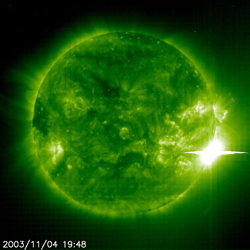 We have found out over the past 20-30 years that the sun is actually quite a prolific producer of gamma rays, in particular, from very high energy solar flares. SC: So how does that relate to quantum physics? Are they both still related because you’re talking about subatomic particles, charged particles? AY: Right. It does, actually, it has a relationship to quantum physics and nuclear physics. When I did my PhD studying solar flares, in particular, I studied high energy particles, protons and electrons, which are accelerated to extremely high energies and they accelerate higher up in the solar atmosphere and they travel down magnetic fields and hit the lower solar atmosphere where it’s much more dense, and this acts like a particle accelerator. Particles are accelerated and slammed into material and these are nuclear processes that produce gamma rays. The solar atmosphere is made up of plasma, which is highly ionized gas, and these processes also produce a lot of heat which heats up this gas. And when a gas or plasma is heated, like say in a neon sign, it produces light, and that’s an atomic process. Again, we’re talking of a process related to very small particles. In order to understand the nuclear processes and high energy flares and emission from the sun in X-rays and EUV (Extreme Ultraviolet) requires some understanding of quantum mechanics, in particular the composition mechanisms from ionized particles and you study that with quantum mechanics. 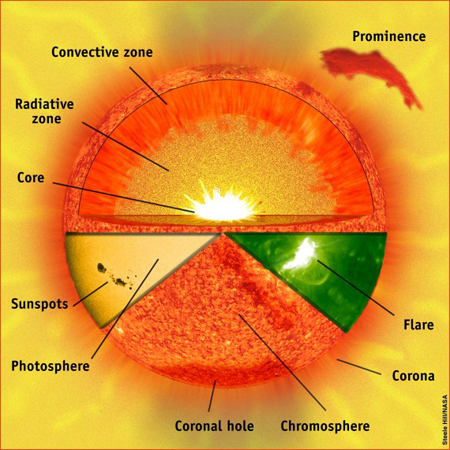 A diagram showing the parts of the Sun. The parts of the interior, the atmosphere, and surface features are shown. That’s one of the things that’s really exciting about studying the sun. It is an incredibly rich laboratory for a lot of different fundamental physical processes which we cannot study to the same extent on Earth. It’s quite difficult to produce the kinds of magnetic fields, the kind of temperatures, the huge gravity that we have in the sun. We have all of these different things going on there, so the sun is a really exciting physics laboratory to study quantum mechanics, relativistic mechanics, plasma physics, particle acceleration. One of the things that’s very exciting in studying solar flares is the particle acceleration. Mechanisms that take subatomic particles and accelerate them to very high energies and produce radiation are very ubiquitous through the entire universe. Black holes, supernovae, all of these sort of exotic phenomena in the universe produce and have particle acceleration going on in them. And this is something that we can study directly on the sun, which we couldn’t do with all these other distant objects. SC: Is the technology that allows you to study that in the sun, instead of building a massive particle accelerator here on Earth, fairly new and safer? AY: Yes, we are able to see these processes which would require a lot of time and materials to build the kinds of particle accelerators to the scale that we have on the sun. But when you do things in a laboratory, the advantage is you have a lot of control over it. The disadvantage of that is that in a lot of cases, you can’t produce the complexity that you have in nature. And so there are certain types of phenomena that you can’t really recreate very well in the laboratory because there’s this aspect of complexity that exists in nature which is very difficult to reproduce. That’s one of the things that’s really exciting about studying the sun. It is an incredibly rich laboratory for a lot of different fundamental physical processes which we cannot study to the same extent on Earth. It’s quite difficult to produce the kinds of magnetic fields, the kind of temperatures, the huge gravity that we have in the sun. SC: Was the STEREO mission a very big step forward in allowing you to collect enough data to study the sun or when did this opportunity become more available to scientists? AY: The 70s were really the beginning of a sort of heyday of solar physics and we had Skylab, we had the OSO (Orbiting Solar Observatory) missions, which were where we first saw gamma rays, for example. But Skylab allows us to see the hot outer corona and X-rays and Extreme Ultraviolet light. But I would say we’re now in the golden age. Starting with SOHO, we were able to see a very big picture of the sun. We were able to see all the way inside the sun using something called helioseismology, which is similar to seismology on the Earth. We’re able to see the lower atmosphere all the way out to the extended atmosphere, all at the same time. So that was a huge leap in terms of all the things that we could study about the sun. Then STEREO took things a huge step forward because we still only have been able to see things on the side of the sun facing us. We have no idea what’s going on on the backside, short of some techniques we do have to peer through the sun. But it’s not very accurate, you don’t see a lot of detail. And that’s, again, using the seismology type methods. With STEREO we’ve learned and always suspected that when something happens at one part of the sun, it can travel, signals can travel and propagate and affect something on the other side. Sept. 22 marked the 5th anniversary of the launch of the Hinode (formerly Solar-B) spacecraft. This joint mission with teams from Japan, the UK, the USA and Norway studies magnetic activity and energy release on the Sun with 3 instrument packages, SOT (Solar Optical Telescope), EIS (Extreme ultraviolet Imaging Spectrometer) and XRT (X-Ray Telescope). Here is a post about the anniversary from the EIS team. Let’s say you have a solar flare on one spot here that can disrupt the environment, things can travel and trigger then a solar flare at a different spot. Now with STEREO, we can see all the way around and we can truly see this. Still the limitation we’ve had with STEREO and also with SOHO, is that we can only see images every so often. With SOHO, we can only see images of the sun in one wavelength at a time, in Extreme Ultraviolet every 12 minutes. So it’s 12 minutes between each image and there’s a lot going on in between, things happening in a much faster timescale. But now with SDO (Solar Dynamics Observatory), we have the ability to see images every 12 seconds. We see ten wavelengths basically at the same time, whereas before we had a filter wheel and we could only do one at a time. And we have a much higher special resolution, so we can see about at least twice as much detail as we could see before. So you combine all that together, we’ve got seeing all the way around the sun and then seeing the sun facing us in incredible detail in time and space at a wavelength or the equivalent of energy that gives us a really, truly, global perspective of the sun which we never had before. SC: When was the STEREO mission launched? AY: We just passed the five year anniversary of the STEREO mission, actually. The STEREO spacecrafts started close together and we were seeing the same side of the sun as the SOHO spacecraft, and then over the years, they’ve moved out about 20 something degrees each year. And they’ve just passed the 90 degree mark, so they’re just slightly around the backside of the sun, which gives us this whole new perspective. The sun is spinning. One of the things that’s interesting about that, and very important for the physical processes in the sun, is that the center, the equator, spins faster than the poles. This is exactly the same thing that happens on gaseous planets like Jupiter or Saturn. And this happens because it’s not a solid body. This is called differential rotation. Actually, this effect, combined with plasmas, is what generates the magnetic fields inside the sun. So this differential rotation — combined with magnetic fields — is really one of the main things that drives solar activity, because solar activity is really based on magnetism. SC: I was reading in your bio that you were hired to work at NASA through a private contractor company, ADNET Systems, Inc, which is associated with Wyle and Honeywell. Does everybody who work for NASA now, the 300 scientists or so at Goddard, are you all under a private contractor or are you hired by NASA directly? AY: No, it’s not all private contractor but the majority of the scientists are under private contractors. We work on a NASA contract. I work on several different contracts, but the main one, which is a large NASA contract that covers various areas in Earth science, space science and astronomy, there are probably about three to four hundred people under that contract. Generally, civil servants, they do science, but they’re also in the managerial position. People who run the spacecraft, the projects, the project scientists and the project managers, those are all civil servants. And so most of us that do the basic science are contractors. Of course a lot of the top civil servants are still doing a lot of the cutting edge science, but they just don’t have as much time, generally, as they’re also running the projects. I’ve actually worked for several companies now. I’ve worked under the same contract, but the contract is rebid every five years, so several companies come in and bid to run this project and basically they say, “Well, we can be the most efficient in terms of all of the infrastructure that we have to bring in, the support staff, and so on.” And in the process, you start working for a particular company and that company may be bought by another company. I’ve always worked for the same NASA personnel. I’ve always worked for my NASA boss who runs the contract on the NASA side, and I do basically the same thing, but I’ve worked for several different companies. The companies send me my paycheck and they handle things like medical insurance and all the things associated with that. But for the most part, it really hasn’t been that much different. However, I will say that some companies have been better than others. The newest company that I work for, ADNET, is run by just scientists. Some of the past companies I’ve worked for were large contractors that also included military contracts and that sort of thing. Very, very big companies. ADNET is a smaller company, it’s a local company, and it’s run by scientists who originally were at Goddard and decided to start their own contracting company. And the company is very efficient. Our company has actually won, each year, the contractor’s rating by NASA. The really fantastic thing about my company is that for the first time we got scores over 90, actually 92s and 95s, several years in a row. It’s a very good company and it’s nice that it’s run by scientists. I know that I’m working for people who understand science, who care about science, as opposed to maybe a large company that we’re just sort of an add-on to them and they’re not quite as excited about what we do. I’m quite happy working for ADNET versus some of the previous companies because we do feel a bit more appreciated and we know that the people who are at the top of the company are scientists. They still are interested in the science and understand a lot of the science and are very proud of it. SC: The Web site, thesuntoday.org, is that your own personal work? AY: That’s me on my own. I do that on my own time. I have a colleague who is now in Belfast, Northern Ireland, at Queens University. He was originally posted at Goddard and he helps me a lot with the Facebook page. He also writes some of the articles that I have on thesuntoday.org. He is an expert in a particular field of solar flares. But thesuntoday.org is really my own project. It’s something that I do in my own time. SC: I was blown away reading some of the basic facts about the sun on your site, that 99.8 percent of all the mass in our solar system is actually in the sun. So how much more important is it to study and understand the sun, a science that is possibly only in its baby stages? AY: Yes, there are so many things about the sun, the scale of it, that still are mind-boggling, certainly to myself and other scientists. The kinds of numbers in terms of how big the sun is, how much mass it has. It is truly the center of our solar system and, to some degree, the center of our local universe. One of the things that I’ve always found really fascinating is that we actually live in the outer atmosphere of the sun. The sun is so hot that the outer atmosphere is not contained by gravity and it is constantly streaming away. It is something called the solar wind. And that solar wind creates a bubble and we live inside that bubble which protects us from space, the interstellar space, cosmic rays and all kinds of harsh things. And so, for all intents and purposes, we live inside the atmosphere of a star. I’ve always found that to be a really amazing thing to think about. SC: Extraordinary! The heat from the sun, is it like ordinary heat? Because you go out in space and you can freeze, so it seems to be a qualified type of heat. When scientists say that the sun is hot or cold, what does that really mean? AY: Yes, but it still does put out radiation that is in the range of infrared that is heat. You know, even though it’s very cold in space, when we put a telescope up in orbit and is facing the sun, it gets very hot. So the amount of energy coming from the sun is incredibly intense. Even in space it’s quite intense and this is an issue when you put a telescope in space. Because what happens is you have a telescope, and the one end that is facing the sun gets very hot. And the other end, which is not facing the sun, gets cold. And when you have metal and plastic that go through temperature extremes, they expand and contract. So you can imagine having huge temperature difference between the back of a telescope and the front facing the sun, and that causes all kinds of problems. We actually have to have cooling and heating on spacecrafts. One of the things that I’ve always found really fascinating is that we actually live in the outer atmosphere of the sun. The sun is so hot that the outer atmosphere is not contained by gravity and it is constantly streaming away. It is something called the solar wind. And that solar wind creates a bubble and we live inside that bubble which protects us from space, the interstellar space, cosmic rays and all kinds of harsh things. You are getting light directly from the sun, including infrared light which is heating up the object. But of course you’re also getting a lot of higher energy radiation, which we are shielded from by the Earth’s atmosphere, things like X-rays and gamma rays and even Extreme Ultraviolet that do not make it through our atmosphere. We’re protected from that. But in space, that protection is gone. SC: There have been a lot of reports and discussion recently about the dangers of the current solar activity and its solar maximum expected in December 2012. Can you briefly guide us through understanding the difference and dangers between solar radiation, a solar flare, a CME, and a geomagnetic storm? AY: Basically, the sun is a hot ball of gas and it has a certain temperature and gives off light. It gives off mostly visible light, but it gives off light through a broad range of the electromagnetic spectrum. That is the everyday sun and that type of emission from the sun doesn’t change very much. Even over the solar cycle, the sun has a cycle of activity that’s roughly 11 years. It can be slightly less than 11, slightly more than 11. But the overall output of the sun, the heat and light, doesn’t change a whole lot. What does happen is over that 11 year cycle the magnetic field builds up inside the sun and it becomes more and more complicated. You can imagine taking a rubber band and twisting it, then it starts to get knotted up, and eventually starts to pop. The same sort of thing happens with these magnetic fields. They get twisted, energy is built up in them, and eventually become buoyant and float to the surface and pop out of the surface of the sun, the visible surface that we see. That is called a sunspot. A sunspot is an area where a very intense magnetic field comes up to the surface and pokes out of what we call the photosphere. 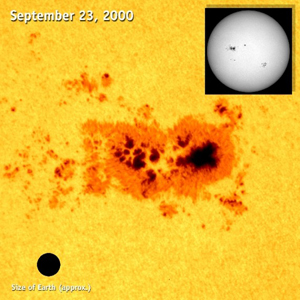 The number of sunspots and the amount of that magnetic field that comes to the surface changes over 11 years. We start off, at the beginning, at the minimum of the cycle with very few if any sunspots and very little magnetic field coming to the surface. Then, as we move up in activity, we see more and more of these sunspots, more and more magnetic fields pop to the surface, and that magnetic field, those sunspots, are where solar activity comes from. You can imagine these magnetic fields like a string that is all twisted up. As it becomes more and more twisted and more and more complicated, eventually energy builds up to the point where it has to release. The magnetic field reconfigures itself, releasing a great deal of energy, heat, and light. When that happens, when the magnetic field releases all this energy, it releases a lot of heat and it moves all the material. One of the things that it does is it creates a very bright flash of light. Imagine, when you have that magnetic field and it snaps, when that release happens, it releases energetic particles which accelerate and interact with the solar atmosphere and produce a whole broad spectrum of light that’s very, very intense, very, very, quickly. That flash, that light that comes out, is a solar flare. In addition to that, from some of the larger events, it also can move material. You can have large amounts of solar material that is blown away from the sun. When that material is blown away, it travels away from the sun and spreads out. That is called a coronal mass ejection (CME). This magnetic field is releasing all this energy and you get this bright flash of light and then you have all this material that’s pushed away into space. That is the coronal mass ejection. In addition to that, you have also particle storms. The flare and the CME both accelerate particles which also travel outward. If you look at images from a big solar storm, you’ll see all this snow in the images, which are the particles that come away from one of these events. Those are the three main parts of a solar storm, a solar eruption. When that flare, the energy from the flare actually hits the outer atmosphere of the Earth — it’s called the ionosphere — it changes its properties. It heats it up and that causes disruptions in communications. We actually use the ionosphere to bounce radio waves off. But if the properties of the ionosphere change from these strong solar flares, strong bright flashes of light and energy, then it disrupts communication. It also causes the atmosphere to expand a little bit. And so if you have a satellite in low-Earth orbit, and the atmosphere starts to expand out, the satellite starts to experience drag. If you have a large enough solar flare, the atmosphere expands out and that can bring down satellites. And it has happened. When we talk about a geomagnetic storm, this coronal mass ejection, the CME arrives after the flare — the flare takes roughly eight minutes to reach us, because it is light, and that’s the speed of light — but the coronal mass ejection is coming out at roughly a million miles an hour. It can be several million miles an hour. If it’s facing the Earth, and the CME is traveling towards the Earth, it takes a couple of days to reach us at that speed. When it travels to the Earth, the CME which is made up of solar material, plasma and also magnetic field all together, it interacts with the Earth’s magnetosphere. The Earth is like a giant bar magnet. It’s a little more complicated than that, but it has the basic structure of a bar magnet. There’s a north magnetic pole and a south magnetic pole. And those magnetic fields together create the structure that’s called the magnetosphere which surrounds the Earth and protects us. The CME comes in, hits the magnetosphere and it pushes it in. And when that pushes it, you have plasma and magnetic field pushing on more magnetic field. In the special case where the magnetic field from the CME is south, and the magnetic field from the magnetosphere is north, they hit each other and reconfigure because of that special configuration. If they were both aligned, not a whole lot would happen. But when they’re like that, you get a magnetic field which releases energy. That energy travels down to the backside of the magnetosphere releasing particles. And also, when that magnetosphere is pushed in, solar wind is able to get closer in. You can have large amounts of solar material that is blown away from the sun. When that material is blown away, it travels away from the sun and spreads out. That is called a coronal mass ejection (CME). The solar wind, which is constantly streaming out from the sun, is able to make it farther into the magnetosphere in these cases. In addition, you have these particles which come from the back of the magnetosphere, they travel into the pole, the North Pole and the South Pole. That’s the geomagnetic storm. You have particles coming in. The magnetosphere is a magnet. You can think of it like a bell. When it gets pushed, it rings, it oscillates. And when you have magnetic fields which move, they create electrical currents. So all of these things together, you have these particles coming in through the North and South Pole, you have currents which are generated in the upper atmosphere because the magnetosphere is doing this, all this together is what creates the geomagnetic storm. And from that, you see aurora because you have the particles coming in the North and the South. This is where the magnetic field is weakest. And those particles hit the particles in the atmosphere, atoms in the atmosphere. In particular, they hit oxygen, sometimes, they hit nitrogen, and that produces light. The most common forms are green, but sometimes you will see red, you will see blue. That is what is causing the aurora. How strong that geomagnetic storm is depends upon how fast that CME is traveling, how much material it has, and how much it pushes on and disrupts the magnetosphere. 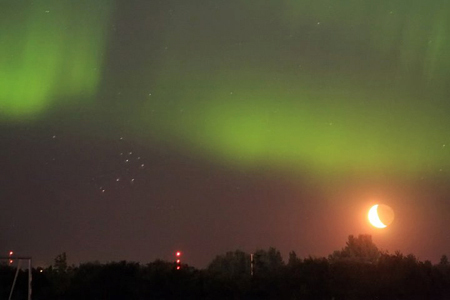 Aurora, the Pleiades, and the Moon! We have the currents that are generated in the upper atmosphere and, when those currents are strong enough, they can actually induce currents on the ground. You can have things like long electrical transmission lines, even pipes, say, that are sending natural gas or oil over long distances. When you have very long pieces of metal and you have currents near them, they can induce currents in the metal. If those currents are strong enough during the strongest geomagnetic storms, they can cause power fluctuations which would knock out maybe electrical power stations. They can disrupt all kinds of electrical circuitry. The biggest impact that you could have from that is you could have entire power grids that are knocked out. And this has happened in the past. We’ve seen it happen over the past several years during large storms in various parts of the world, very isolated, usually, within a country’s power grid. We have examples of it happening in Norway, South Africa, but one of the most famous examples was in 1989, in March. We had a storm that was very, very strong, one of the largest ones that’s been recorded in modern times, and it knocked out the entire power grid of northeastern Canada and Quebec. 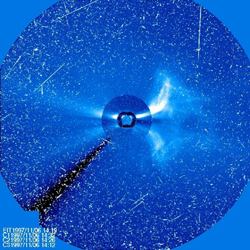 In these types of things, you have the flare, you have the CME, and you have the particles next that I mentioned. 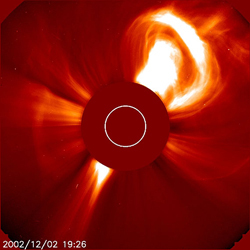 The CME — the flare itself can accelerate particles into space, because the flare accelerates particles which go down and that generates light, but sometimes the particles can go up and escape into space. Also, the CME travels through space and scoops up the particles in front of it, because that space is filled with particles from the solar wind. And if it’s fast enough, and scoops them up fast enough, it acts like a snowplow and accelerates those particles, and that gives us another type of particle storm. Those particle storms can cause damage to electronics on spacecraft and satellites. It is dangerous for astronauts who are in space, because they’re not protected by the atmosphere. In the past, it was a concern for things like the space shuttle, and now it’s of concern for people on the International Space Station. If these events are strong enough — they’re very rare — but if they are strong enough, they can actually create particles which make it to the ground. And those particles, very energetic particles that make it to the ground, can also interact with electronics on the ground. Now, that’s far less common, those are some of the biggest events, but you could have disruptions. When you have electronics, solid-state circuitry, and you have a high energy particle traveling through it, it can create what’s called a single event upset. In computers, basically, everything is contained in 0s and 1s, and if you have a high energy particle go through some solid-state equipment, there are times when you can have 0s that change to 1s or 1s change to 0s. That seems like not a big deal, but for a computer, when you start having that happen in a large scale, you start getting errors. Computers have errors sometimes we don’t understand and sometimes the reason computers just stop working or have problems is actually because of these single-event upsets. But they’re much more rare. We’re very protected on our planet. We personally have nothing to worry about in terms of that kind of radiation because even the strongest events are not going to create any level of radiation which would have any sort of impact on human beings. The biggest impact that you could have from that is you could have entire power grids that are knocked out. And this has happened in the past. So you see there’s a very rich set of phenomena that make up solar eruptions and they all have different effects that they can produce, mostly on technology. One of the things that’s really important about studying the sun, and studying this area we call space weather — we call all these phenomena, as a whole, space weather. It’s very important to understand because as we become more technologically advanced and our society becomes more dependent upon it, unfortunately, we become more and more susceptible to these types of phenomena on the sun. This is one of the things that will be very interesting now that we are moving up in solar activity. Over the next couple years, it will continue to increase and the solar maximum will probably be around late 2013, 2014. And one of the things that’s going to be interesting is that we have a lot of technology now that we didn’t have 10 or 11 years ago. We have a basic understanding of a lot of the different effects, but as you take complex technology and you mix it together when things happen, unpredictable things can happen. Complex systems make things much more interesting. We know some of what these individual effects would be. But we don’t really know what the overall effect is going to be. I don’t want to sound kind of alarmist, because I don’t think that we really have something to fear. But I think that studying the sun and studying space weather is very analogous to studying weather on the Earth. I mean, you know that if you live near the coast in Florida or on the Gulf Coast, you’re going to have hurricanes and you’re going to have them every year at about the same time. The hurricanes have a cycle, the sun has its own cycle. You don’t spend your year worrying about hurricanes, but you prepare for them, and you know they’re going to come. You do the things you need to do to get ready for it. The same sort of thing is the case with space weather. We can see when these events are going to come. The most damaging and the most impact comes from these CMEs, and we have a few days before they come. When you have electrical disturbances, there are a lot of things you can do. For example, very similar to when you have a big thunder storm and you know lightning is going to come, you know that the best thing to do is to unplug your electronics so that if lightning strikes your house, it’s not going to fry your electronics. Well, it’s quite similar with spacecraft. I mean, you literally can turn them off or turn them down, and put them into safe modes. We know some of what these individual effects would be. But we don’t really know what the overall effect is going to be. Power companies are very aware of this and power companies take measures during high solar activity so that if there’s a power surge, they’re prepared for it. That doesn’t mean that there isn’t going to be a day when there’s a really big one and it might be so big that they still lose power. So it’s something that we should all be aware of. We should all think about it. It’s very important for our society to study and understand, but it’s not something that we should spend our daily lives worrying about and being concerned over. We invite you to continue our conversation with C. Alex Young, PhD, next week, where he goes into more detail about the possible effects on Earth in the case of a major solar event. What could happen to an airplane’s navigation system or electronics on the ground? How does NASA protect their technology from solar activity? How long does it take a solar flare and CME to hit the earth, and does it hit the entire planet all at once or is it localized? Is the solar activity melting the poles faster or contributing to climate change? Can the sun impact the integrity of the Earth’s tectonic plates and unleash earthquakes and volcanic activity? According to the data collected, what is the worst scenario foreseen for 2012 or the solar maximum of this sun cycle?